“Exploring Oregon Ecosystems: From Oak Savanna to Riparian Woodland” is an environmental education program with outdoor experiences for both teachers and 3rd-grade students. By developing a deeper understanding of oak and riparian ecosystems this project will provide a pathway to engage students in an inquiry-based field and classroom program. The project is being led by Greenbelt Land Trust, the Institute for Applied Ecology, and Marys River Watershed Council with generous support from the Gray Family Foundation, Willamette Habitat Restoration, and others. To volunteer, please CLICK HERE. I stood just inside the old farmhouse next to the creek at Bald Hill Farm, looking out at snow dusted slate blue mountains. A large bird was gliding towards the house. The closer she flew, the bigger she appeared. She was bulky, wings forming a flapping “M”. 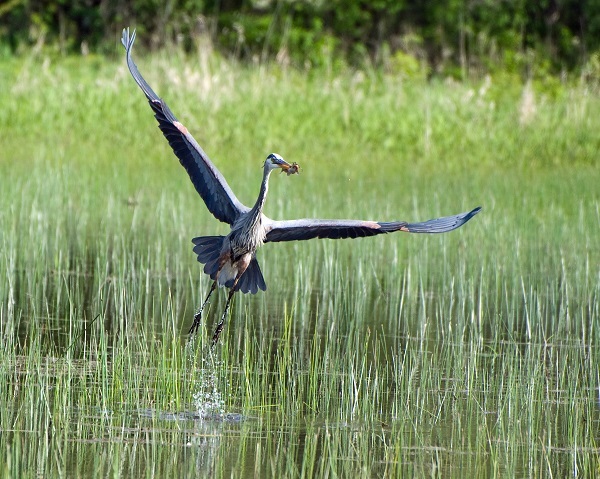 The bird turned south in her flight, showing the crook-necked profile of a great blue heron—a bird that can have a wingspan as wide as a basketball player is tall. The heron sighted the creek, which had just been daylighted for the first time in years. That morning Greenbelt’s dedicated volunteers Clem LaCava and Jim Roy had cut down dead canes of exotic blackberry that had previously covered the creek, and the heron honed in on the newly exposed water. She glided down and into the channel, just a hundred feet away from me. 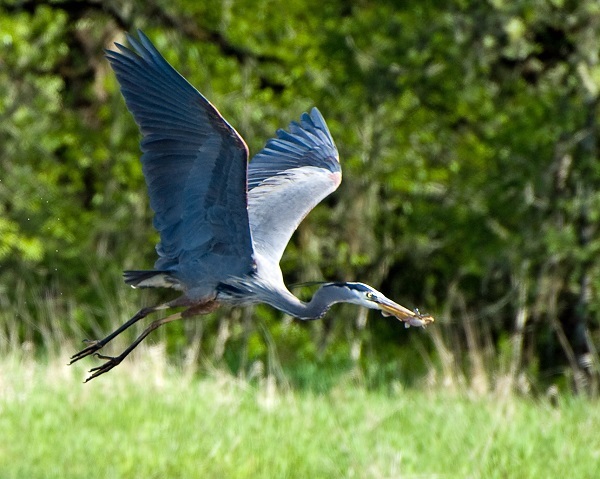 Herons hunt in water and on land alike. 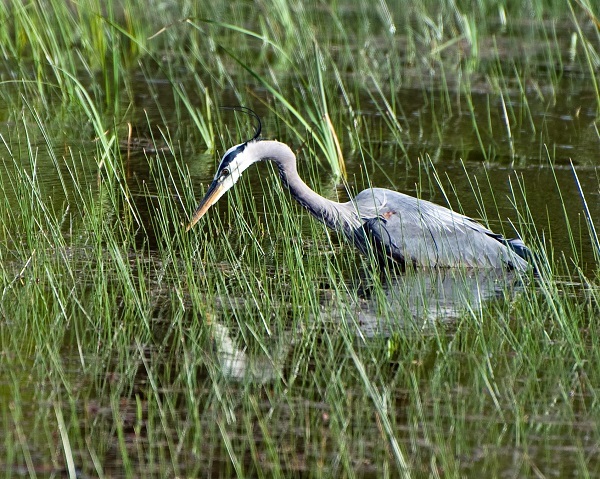 I’d seen this heron foraging for rodents in nearby fields but this was the first time I had seen her in the creek. We were clearing exotic blackberry off the creek to make space for native plants. Red osier dogwood, snowberry, osoberry, thimbleberry, pacific willow, and others would be planted in the opened area. As they grew, they’d shade and cool the water, improving conditions for fish like cutthroat trout. The shrubs would also provide habitat and food for a variety of birds and wildlife. The new native plants are being sponsored as part of the Explorando Ecosystemas de Oregón/Exploring Oregon Ecosystems. Through this program 240 Corvallis 3rd-graders will help the trees establish by applying “donuts” of bark mulch to help keep down weeds and hold in soil moisture. The kids will also be comparing stream and savanna habitats, studying water quality, doing a nature scavenger hunt and more. And dual immersion students from Garfield School will be learning totally in Spanish, thanks to talented bilingual volunteers. Greenbelt and our partners just secured funding to continue this outdoor education program next year so that students can study birds that migrate between the Willamette Valley and the Laja River Basin in Mexico. Children in Corvallis will communicate with children in Mexico about great blue heron, rufous hummingbird, black-throated gray warbler, and other birds that depend on habitats in both locations. The heron arriving at the creek in almost the moment the blackberries were cleared seemed like a good sign. The birds are just waiting to explore habitat being restored with help from our volunteers and students. And the students are just waiting to experience the wonder of the birds and to learn about being responsible stewards of the land that makes a home for herons, kids and all of us. Written by Elizabeth Records – Land Steward, Greenbelt Land Trust. Photos courtesy of George Gentry.